With only a couple of days to go to our March Cakeup, we hope you are all as excited as we are and ready to be cocktailed out! For those who didn't manage to register in time keep an eye out on Twitter and Facebook for any last minute spots that may become available. If you were lucky to get a spot (be it baker or guest) then we will see you on Saturday 22 March at 3pm at Mint Bar. Our guest poster of the week is Andrew - one of the two men who attended our February Cake Up at the Essential Ingredient in Kingston. There may of only been two men, but boy did they impress! 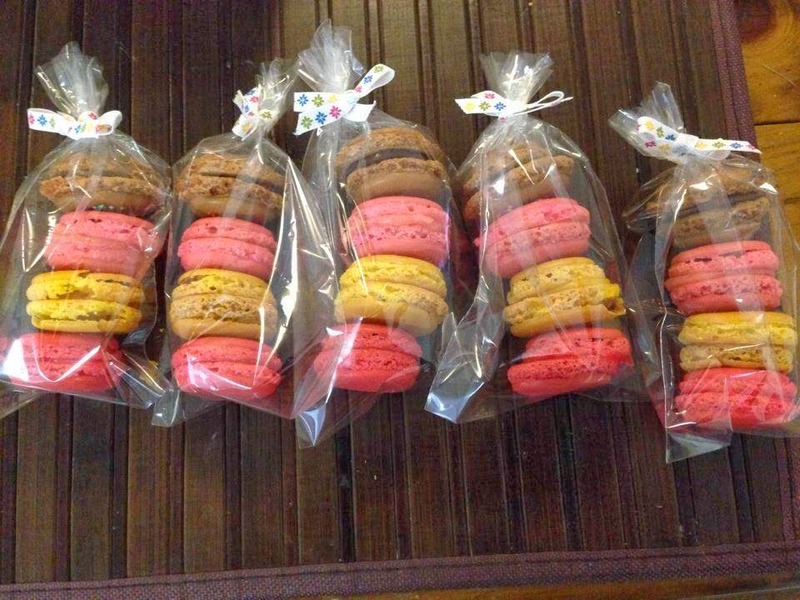 Andrew delighted us with some very colourful macarons and had lollies as his secret ingredient! Over to him to tell us a bit more about himself and hand us over the recipe! So I was asked to be a guest a blogger for this week for the cake club so thanks guys for the opportunity. So, where do I start? Ok let's start with me. I've only been baking for about 4yrs and my first attempt at making chocolate chip cookies was a dismal effort and resulted in a puddle of inedible mess. But I didn't let that stop me and I tried again and I got them right the second time. I then tried my hand at cupcakes and cakes and found that I could bake things that people were actually happy to eat as they tasted good! So this lead to me baking and taking things to work for people to eat and there was never a shortage of people willing to taste test my baking. Morning teas were an excuse for me to bake and take sugary goodness to work. I guess the thing about me baking that still makes me laugh is that some people find it hard to believe that I bake and can make delicate sweet treats that look and taste good. I think it's a because of a few factors. One I'm a guy that bakes and two I am heavily tattooed and I guess that people just don't expect baking from me. But I do like surprising people! I get asked by people that don't know me 'who made that' when delivering cakes and the answer is of course me, to which I normally get 'what you made these yourself? No one else' and yep the answer is I made them all myself with my own two hands. I really have no idea where or how I learnt to bake but my grandad on my mums' side baked, I never met him but maybe it's passed down. I've recently started a side business after friends telling me I should make a business out if this so that's just what I have done. I've launched Sweet to the Bone, making cupcakes, custom birthday cakes and biscuits. I love making birthday cakes to order, recently I made a Tardis cake which was fun. I found out about the cake club via Twitter and everyone at the first meeting I went to were all really nice. There was only myself and another guy that baked so least I wasn't alone. the meetings theme was 'a secret ingredient' and I was struggling with an idea and while Googling I found a recipe for red skin ganache which I thought would work great as a macaron filing and I used it for musk, freckles and banana to make my lolly bag macarons I took with me. Everyone said they looked and tasted great and they were all gone! I guess that's a good sign. Now with a spatular gently fold in the sugar/almond meal and add any colours now - this is where I added the red for redskins, pink for musk, brown for freckles and yellow for the bananas. Once cooled pair up sizes and fill with filling, I made one mixture per colour and flavour and made about 30-40 each depending on the size you pipe. Heat cream and redskin lollies in a pan until lollies are melted and you have a runny pink liquid. Pour over the white chocolate and allow to stand until melted then mix until smooth. Allow to cool. Heat cream, pour over chocolate and allow to stand. Mix until smooth and add hundreds and thousands. Allow to cool. Heat cream and banana lollies until you have a runny yellow liquid. Pour over white chocolate and allow to stand. Mix until smooth and allow to cool. Heat cream with musk sticks until melted. Pour over white chocolate and allow to stand. Mix until smooth and allow to cool.